Ready to put Valentines Day behind you? 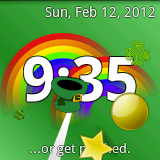 Well, we just put Alltock Shamrock up on the forums so you can get a head start on St. Patrick's Day. Yep, that's a real double rainbow on your WIMM One! We added one small feature to the Alltock engine this time around. In addition to sweep and arc displays for the second hand, we now have a "tick" display. Swipe left to right to cycle through these modes. You can get our first build from the forums.